We reviewed eight of our favorite big wall aiders and used them on more than 100 walls, from El Capitan to Baffin Island. We evaluated the contenders using five main criteria: comfort, ease of walking up, durability, ease of use free climbing, and top-stepping. We then chose our top products in three categories: aid-intensive big walls, free climbing-intensive big walls and best aiders on a budget. Aiders are the most frequently used piece of big wall-specific gear so getting a pair you love is as important as getting a harness that fits right. However, keep in mind that more important than the aider is the technique you use in walking up it. Comfortable, intuitive to use, durable comfortable, intuitive to use, durable Comfortable steps, easy to walk up, big grab loop. great top-stepping, comfortable, good value Surprisingly comfortable webbing width, low bulk, good value. Heavy, bulky heavy, bulky No spreader bar. not as durable Bottom step flips inside out. 1.75" 1" 1" 1" 0.8"
The Yates Big Wall ladder stood out for its comfort and ease of use, especially on steep terrain. It is pretty expensive ($60 for 6 steps) but its durability means you won't wear it out. Chris McNamara uses the 6 step but you might want the 7 step for hard aid. The Metolius 8 Step Ladder was another great option if you don't mind it missing the spreader bar. It scored up there with the Yates and is less expensive. For a wall with a lot of free climbing such as The Nose or Salathe or Lurking fear, we prefer the optimal comfort-to-weight ratio as well as the affordable price of the Metolius Alpine. For value, you can't beat the Fish Smart Aiders at only $47 a pair. Chris Mac did his first handful of walls with them and liked them until he started preferring aiders with more reinforced steps and more top-stepping options. Also, if you climb with four aiders (which we strongly discourage), using four of these is going to be one of your lightest options and save you more than $100 over any other four-aider setup. We like the Metolius 5 Step ($36). Chris Mac did most of his El Cap ascents with these and loves them, except for the fact that they blow out after a while. He usually uses the 4 Step but always takes the 5 Step on hard aid such as Reticent Wall. The Metolius gets our Best Buy Award because it is very high scoring while being one of the least expensive products we tested. If you prefer ladder style, the Metolius 8 Step Ladder would get the Best Buy award. As Chris McNamara stresses in his How To Wall Climb chapters, it is your efficiency at aid leading that has the biggest effect on big wall success. When choosing climbing gear, it's easy to get sucked into spending way too much money. To help you decipher which aiders are going to give you the most functionality relative to their price point, we compiled the chart below. Hover over the dots to see where each contender lands. Blue dots represent award winners, and the further into the lower right quadrant a product falls, the greater we believe its overall value to be. The Yates Aid Ladder with a layer of 1.75" webbing on top of 1" (the widest we tested), combined with a sturdy spreader bar at the top, stood out as the most comfortable to stand in. Second was the Metolius 8 Step Ladder. The most comfortable etrier style model was the Metolius due to the extra Biothane(tm) layer in the step, which gives it more structure to stand on while lowering the squeeze on the side of the foot. The Metolius Alpine was surprisingly comfortable for being so small. The Petzl Gradistep was the only truly uncomfortable one to stand in, but that was to be expected for such a lightweight and compact model. Overall, the ladder-style models were easier to walk up than etrier-style. Most noticeable was the difference when first stepping in on horizontal pitches. The etrier-style requires that you put your foot in the correctly oriented step, which is not always the step you want at the right height. Again, with its big reinforced steps, the Yates stood out for its ease of walking up. We have noticed it is especially easy for beginning big wall climbers to get the hang of them. The Metolius Ladder is easy to walk up until you get to the top steps, where a lack of a spreader bar makes it a little tricky to get your feet in the top steps. The Metolius with its reinforced steps was the easiest etrier-style model to walk up. All the products above also did well in the "fishing with your foot test" where you see how easy it is to get your foot in it the first time (without using a hand for assistance). Over time, most aiders without the reinforcement get harder to step into and the steps want to stay narrower. The lightweight models such as the Petzl GradiStep are the hardest to walk up because the lack of structure makes the steps harder to get your feet into once weighted. We found we often had to use a hand to get our feet in. If you only climb a few walls, durability is not a huge issue. All the models we tested held up for at least 10 walls. However, if you are going to climb a ton of walls, you might want to consider how well reinforced the steps are. Overall, the Fish Smart Aiders were the most bomber. After 40-plus walls, it was still going strong. The Yates after 20+ walls still does not show much sign of wear. After heavy use on 15-plus walls, the Metolius 5 Step blew out (the stitching became abraided, causing the steps to completely blow out). This could be solved with either more bar tacks or an extra piece of webbing sewed over the key stitching point or maybe using PlastiDip. We didn't blow out any other contenders, but we also did not use them as much. In addition to being the lightest, the Petzl GradiStep can be put in its own bag, which makes it very low profile. You almost forget it is clipped to your harness when doing free moves. In contrast, the features that make the Yates Aid Ladder so comfortable mean it is very bulky when clipped to your harness and the reinforced steps easily get caught in cracks. The Metolius 5 Step doesn't get quite as easily stuck in cracks, but the reinforcement that makes it so comfy can get really stuck. The Metolius Alpine was surprisingly comfortable for being so lightweight and not bulky. Aiders without urethane reinforcement, like the Fish Smarts, are less likely to get stuck in cracks when you bust a free move or two and want to let them dangle (as opposed to taking the time to bunch them up and clip them to the side of your harness). Overall, the Metolius 5 Step with sub steps in the top two steps gives you the most options for top-stepping. It also had the highest step so on low angle terrain it lets you reach the highest (unless you want to put your foot in the grab loop). 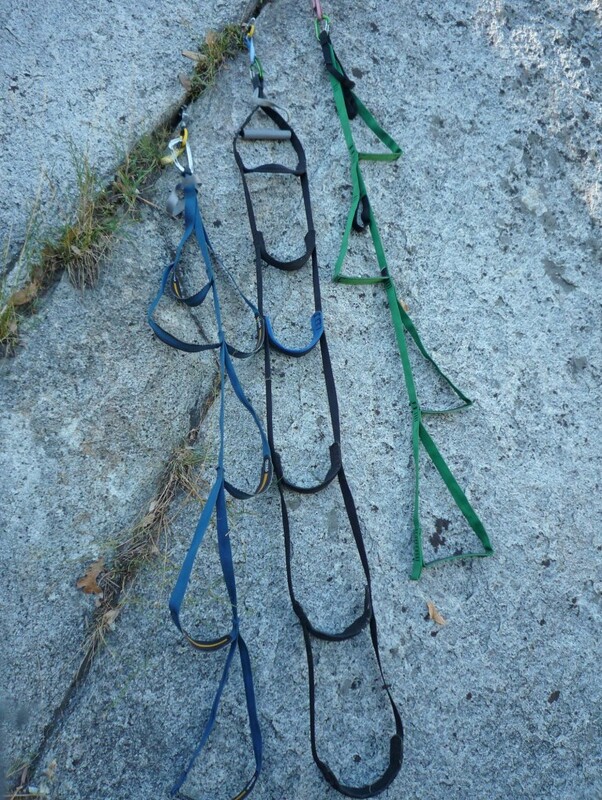 Of the aid ladder- style, any aider that does not have a spreader bar (like the Metolius Aid Ladder) is very hard to get in the top steps if you are only using two aiders total. The Yates was better for top-stepping but the Metolius Ladder did have a bigger grab loop so you can get your foot in for that occasion "super top-stepping" move. The type of aider you choose will depend on the type of wall climbing you prefer. Just as important to consider is which aider would best fit your technique. Almost every product we tested excelled in a certain application or was a great value. We compare the two top ascenders whether you are climbing El Cap or putting together a self-rescue kit.